I recently returned from a moving and emotional visit to Krakow, Poland, a city rich in Jewish history as well as tragedy. Jews have lived in Krakow for over seven centuries, but the Germans nearly succeeded sixty years ago in wiping out any Jewish presence in the area. Now, after Nazi persecution and Communist oppression, a miraculous rebirth of Judaism is slowly, tentatively taking place there. As I note in the article below, it is just one more reminder that the Jewish people are eternal and indestructible. This past Shabbat in Krakow, Poland, Benjamin Klein had every reason to let the tears flow freely. The scene was the city's famed Rema synagogue, where the great 16th century scholar Rabbi Moses Isserles once presided. The small sanctuary was filled to capacity, as the melodies of Friday evening hymns and supplications filled the room. Hundreds of religious Israeli high-school girls packed the women's section, overflowing into the hall while dutifully reciting the service. The men's section represented a microcosm of world Jewry, ranging from aging Polish Holocaust survivors to a Bnei Brak rabbi to members of a high-powered AIPAC mission from the United States. It had been 66 years since Klein had last prayed here when, as a Jewish youth growing up in Poland, he was forced to flee in the face of the Nazi onslaught. At the time, he no doubt thought he might never see his birthplace again, let alone experience a traditional Shabbat service in the synagogue of his childhood. Indeed, on the eve of the Holocaust, Krakow was home to some 68,000 Jews, who constituted 25% of the city's population. Kazimierz, the old Jewish quarter, where the Rema synagogue is located, was a bustling center of Jewish religious, cultural and intellectual life. But the Germans and their allies murdered 90% of Krakow's Jews, striking a nearly fatal blow to the city's centuries-old Jewish presence. Now, decades later, Klein had come back to visit, having survived war, persecution and calamity. And what he found was simply overwhelming, even for a man with considerable resources of inner strength and fortitude. In the heart of this blood-soaked land, where Jews had been so ruthlessly hunted down and killed by their former neighbors and friends, the melody of Lecha Dodi ("Let us go and greet the Sabbath bride") was once again being recited in all its power and glory. And, just three weeks ago, Krakow welcomed Rabbi Avraham Flaks, who was sent by Shavei Israel, the organization that I head, to serve as the city's first official Chief Rabbi since World War Two. As he took in the scene around him, Klein's eyes began welling up. "Now, I know," he whispered to me, his voice breaking with emotion, "now, I know. We really are an eternal people." 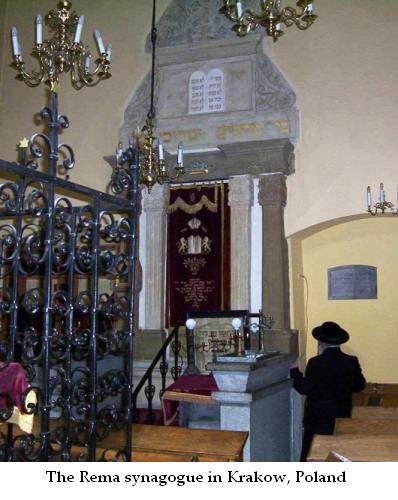 Under the devoted leadership of Polish Chief Rabbi Michael Schudrich and Jewish community president Tadeusz Jakubowicz, Krakow Jewry is slowly working to rebuild, renovating synagogues and cemeteries, reclaiming Jewish communal property and trying to reach out to the unaffiliated. Only 157 people are officially registered as members of the community, but it is widely believed that over 1,000 additional Jews live in Krakow, many of whom have only recently discovered their Jewish roots. After the horrors of the Holocaust, which were followed by decades of communist oppression, many Jews sought to hide their ethnic and religious identity, even from their own offspring. Now, however, many of these "hidden Jews" have begun to emerge, seeking to reclaim their heritage. ON FRIDAY evening, I met several of these heroic returnees, three young women who have chosen to defy societal pressure along with deep-seated anti-Semitism in order to embrace Judaism and return to the faith of their forefathers. It was nearing the end of the Sabbath meal when I went over to their table to introduce myself. Noticing that they were in the middle of saying the Grace After Meals, I sat down quietly and patiently waited for them to finish. With deep concentration, they carefully recited each sentence, taking well over 10 minutes to complete the relatively short prayer, thanking the Creator for the food and nourishment that He provides. While doing so, they slowly rocked back and forth in their seats, as though their souls were dancing in tandem with the words. "There were all kinds of hints in my family that we were Jewish, but everyone was afraid to talk about it," said one, whom we'll call Anna. "I have no proof, I have no papers. I always felt a pull to things Jewish, but I never understood why," she said. Until, that is, when she uncovered her family's most carefully-guarded secret. "Immediately after the war, my great-grandfather changed his family name from a Jewish name to a Polish one. As soon as I discovered that," said Anna, "I knew I had to come back to my roots." Asked where she sees herself in 10 years‚ time, Anna blushes before letting out a nervous chuckle. "Married, with children," she says, quickly adding, "Jewish children, of course. I want my kids to grow up as proud, halachic Jews." After getting up from the table, I notice a young bearded man wearing a yarmulke, speaking in Polish with one of the waiters. Later, when I asked Rabbi Schudrich about him, he proceeded to tell me the young man's remarkable story. As a youth, the boy had a girlfriend. Both were fervently anti-Semitic skinheads, who later married each other. Shortly thereafter, the wife discovered that she had paternal Jewish roots. Her interest in Judaism deepened, and she began making special meals to mark the Sabbath each week. Though shocked, the young man went along because he loved his wife. But his parents were nonetheless upset, and insisted that he put an end to his wife's burgeoning interest in Judaism. When he confronted them about the intensity of their opposition, his parents broke down and revealed to him that they both, in fact, were Jews, and that for decades, they had sought to hide their identity for fear of the consequences. Now, several years later, that young couple, who began their married life as anti-Jewish skinheads, are now living as Torah-observant Jews. ON SHABBAT, as the Torah was being taken from the Ark during the morning service in the synagogue, the voices of the Israeli high-school students rose up in a crescendo, their crisp and clear Israeli-accented Hebrew echoing throughout the small sanctuary, and doubtless beyond to the heavens above. "To You, O L-rd, is the greatness, the power and the glory..." all those present sang in unison. I turned to see Benjamin Klein's reaction and to gauge whether he found the moment as moving as I. When I did, I noticed that the tears in this holy place were once again flowing freely. Only this time, they were my own. The writer is Chairman of Shavei Israel (www.shavei.org), a Jerusalem-based group that reaches out and assists “lost Jews” seeking to return to the Jewish people.